Those of you who follow the blog know my inner geek lets me include space as part of the natural world. I just have to pass along this very cool and rare opportunity. As you may know, the US space shuttle program is coming to an end and the shuttles will soon be retired. There are very few opportunities left to watch the shuttle orbit overhead. There are even fewer opportunities to watch one land. 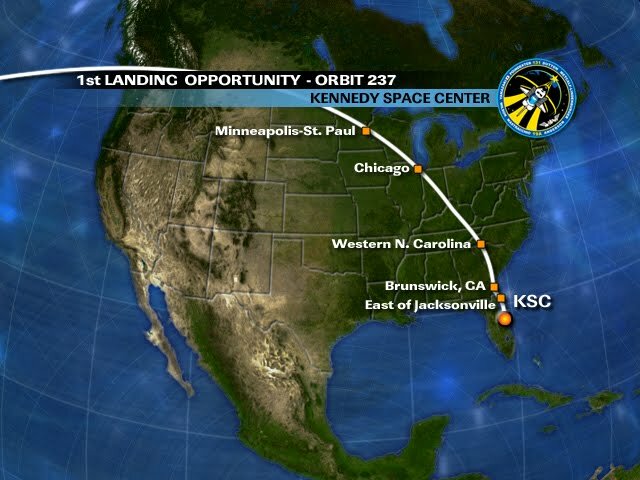 The landing flight of the space shuttle does not usually take it over Minnesota but the current shuttle mission is scheduled to re-enter the earth's atmosphere right over the twin cities. This is known as a rare descending node re-entry. Here is the current predicted ground track. It also takes the shuttle over Chicago. The ephemeris online shows the shuttle will first appear over the twin cities at 6:14 AM and will transit and disappear by 6:19 AM. The prime sighting will be at exactly 6:16 when the shuttle will be 67° high in the sky and passing within 43 miles of St. Paul. The shuttle should appear roughly from the north. Sunrise is at 6:20 tomorrow so it is hard to say whether we will be able to see the shuttle streak across the sky like a meteor of fire or whether it will be washed out against a brightening sky. If you go out to watch, be sure to listen as well. The shuttle will be traveling at supersonic speeds and will produce a double sonic boom. It takes about 1 minute 30 seconds for the sound to reach earth after the shuttle passes overhead. 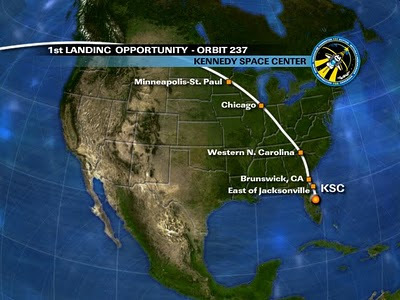 The shuttle was supposed to land on Monday but the landing was scrubbed due to poor weather. The old route would not have taken it over Minnesota. If weather is poor at Kennedy Space Center in Florida the shuttle will land in California and we'll unfortunately miss the show. I'll be up for it. We'll see what the weather has in store. This is so cool. I was looking at the track for yesterday's landing and was sorely disappointed that it was so far west. I'll be up too! Oh, shoot, I wish I'd seen this post last night! So, was it visible? Unfortunately the first landing attempt was scrubbed due to fog in Florida. They landed an hour or so later but took the more traditional southern route so it was not visible locally. Bummer.